When 'Sevens' are rescued after many years of neglect and deemed to be a suitable restoration project the fuel tank may look sound but will probably be full of rust, the metal weakened and even holed. Having found this problem on a 'Seven' I gave the tank a very good shake which loosened up much of the rust and poured it out of the filler pipe; in the photo you may just be able to make out a 50p coin, this gives you some idea of the amount of rust! Whilst on the subject of removing the tank sender unit a little tip may be in order. Make sure the slots in the screws are fully clean to the bottom of the slot and that screwdriver you are using has a good tip, not one that is rounded, and is at least the width of the head of the screw and has a long shaft and a good handle. (The shaft and handle will help keep the screwdriver plumb to the axis of the screw and allow plenty of rotational force). If you very slightly tighten the screw before undoing it very often this breaks the screw's grip and it will come out without snapping off. Some of the screws snapped off so, once the unit was removed, these were either gripped in the jaws of mole grips (where they stood proud of the surface) or ground down to as flush as possible, centre popped and drilled out. I found that a 4mm tap was a good fit to the threaded hole but I am sure that the original would have been an imperial thread. When replacing the unit it is best to use brass or stainless steel screws. If the heads of the screws have already been attacked by a previous restorer and will not allow the screwdriver to grip properly, carefully grind off the heads of the screws then use the mole grips method. It could almost be argued that this is the best method; those screws I undid with the mole grips were the easiest to get out, I am sure that the grinding off of the heads applied heat and vibration to advantage. 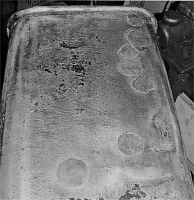 Once the rust has been removed examine the surface of the tank, particularly the underneath where pinholes may be found. 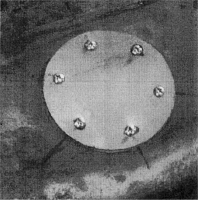 To cure these; firstly form a depression around the pinhole giving about 1/8 inch deep and about ½ inch diameter crater (bigger diameter for bigger holes). This is then filled with a two part fuel tank sealer epoxy putty which is available from motor accessory shops. 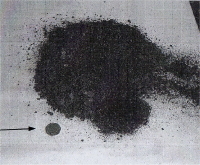 The instructions will show that the sealer should not be used where the fuel will be in constant contact. Ignore this as we are going to coat the inside of the tank, the putty is mainly to keep the sealer in the tank. You can see from the picture that there were several pin holes have been filled. Before using the sealer inside the tank take out the drain plug and clean the plug and the surrounding hole. You will notice the end of a pipe, inside the tank, in line with the hole. This is the outlet pipe from the tank to the engine. Make sure it is not blocked with rust and dirt. It is easier to do it now than later when you have a full tank of petrol. There is one further point to make. If you look inside the tank through the sender unit hole you will see the fuel outlet pipe going towards the bottom of the tank. You may also see a fuel filter gauze all round the pipe, fixed to the bottom of the tank. At some time, either before you apply the sealant to the tank, or after the sealant is dry, you will have to poke a hole in the filter gauze because it will now be fully covered with sealant and prevent fuel from getting to the outlet pipe. If you are concerned about replacing the filter then put an in-line filter into the fuel line to the engine. Strictly this should not be necessary as once you have sealed the inside surface of the tank there should be no dirt particles lose in the tank. Now you need to make a blanking plate to go over the fuel sender unit hole in the top of the tank, you can manage without but to spread the sealer all around the tank you will need to rotate and invert to tank several times. Also block off the fuel outlet pipe where it leaves the tank. At this stage you would be well advised to use a rust treatment on the tank. 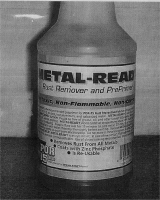 POR15 'Metal Ready' which treats the rust and coats the surface preventing further rust action. Follow the instructions on whatever product you use. In my case the rust treatment was washed out with water and immediately thoroughly dried by placing over a convector heater. Do make sure it is really dry before adding the sealer. 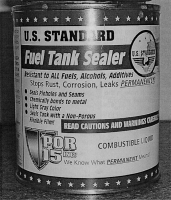 I used POR15 Fuel Tank Sealer, available from 'Frost', which looks just like silver paint, it isn't, it is the sealer! Give the tin a good stir and make sure that any sediment is put back into the mixture. Now is the time to check that all the 'stoppers' are in place, otherwise the sealer will finish up on the floor! Pour the sealer into the tank and proceed to slowly rotate the tank in all directions causing the sealer to flow around the tank, covering all surfaces. The baffles in the tank mean that you need to do this more than you would at first anticipate, about 10 to 15 minutes. Remove the sender unit blanking plate and had a good look around with the aid of a torch. Do not leave the sender unit in the tank when you area sealing it! When you are happy that you have covered the inside pour off the excess following the instructions. You will find that you only use about half a tin and it may be possible to do two tanks as long as you do them at the same time. Finally leave the tank to dry. This article, written by Malcolm Watts, originally appeared in Seven Focus Apr 2002 pp7-10.